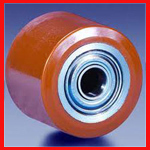 Polyurethane load rollers, also known as heavy duty load bearing rollers, help move heavy loads. High performance urethane is a non-marking, non-slip material that can reduce noise and maintenance costs. It resists abrasion, is capable of supporting heavy loads, and resists oil, ozone, radiation, corrosion, and low temperatures. 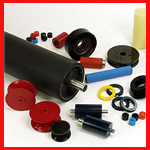 Precision rollers are available as: concave roller, convex roller, straight roller, hubbed roller, v-groove roller, bearing cover, coated bearing, bushing, and more. Load rollers made from polyurethane serve the construction, mining, and oil industries more efficiently than their rubber counterparts. 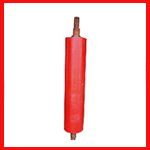 They also offer several benefits over steel load rollers. Polyurethane load rollers are ideal for heavy-duty applications. Even in wet and oily environments, they are effective at performing the job at hand without a decrease in performance. 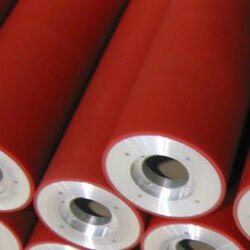 Our rollers are designed in a highly controlled environment. They are tested to confirm their ability to withstand rugged and challenging environments. 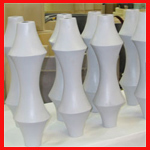 Their stress tolerance is also pre-determined to slot them in specific industrial applications perfectly. We offer customized solutions, designing load rollers that match your needs perfectly.